I made an autumn trip to Lapland, to the top of Finland and to the top of Europe. Lapland, the wild north has reindeer, fells and auroras. And autumn ruska, as the Finns call it, yellow leaves. What was the place then? Kilpisjärvi, or Gilbbesjavri in the local Sámi language. Why did I go to Lapland in autumn? It’s not snow season yet and Santa Claus still hides in his cottage. I went for the fantastic colors that no place else than Lapland has: the green auroras of the night sky. And the fells in yellow, orange and red of daytime. These students have gathered to Finland from all over the world. They are busy with their master’s program and this week they were having an Arctic seminar on health in peripheral places. Half day seminar and half day hiking. In colorful Kilpisjärvi autumn. Kilpisjärvi is so far away. A six hour drive from Rovaniemi, 400 km. And to reach Rovaniemi you first need to travel 800 km from Helsinki, the capital, or 700 km from Tampere where we started. So getting to the absolute north takes a whole night plus half of the day. Is it really worth it? It is, definitely. I will show you why. Kilpisjärvi is located quite in the north of Finland, at the end of the Finnish “arm” that stretches towards the Arctic sea but doesn’t really reach it. In between are the high Norwegian alps that keep their snow cap even in summer. The Arctic sea is just one hour from Kilpisjärvi. That’s no distance at all – in Lapland. So the Finnish arm has Norway on one side and the Swedish Lapland on the other, both very close so you can hike in three countries within one day – which we did. I will show you the hike. Kilpisjärvi is a part of Enontekiö community and famous for its fells that are the highest in Finland. In all there are 40 fells, the highest of which is Halti, 1324 m.
On the photos you can see Saana fell that is steep on one side. Saana is 1029 m high. Fell Lapland is a good place for hiking. The landscape is wide and open. You have great views in all directions most of the time since only small trees grow in the north. The climate is too hard for normal trees. Enontekiö has more than 800 lakes of which Lake Kilpisjärvi is the biggest. You can take a flight or night train from Helsinki to Rovaniemi and a regular bus on to Kilpisjärvi. Buses leave just outside Rovaniemi train station. There are also flights to the other Lapland airports Kittilä and Ivalo that are closer to Kilpisjärvi. At least Kittilä airport has bus connections to Kilpisjärvi. Or – if you want to make it super easy just rent a car. If you arrive by public transport think about renting a bike in Kilpisjärvi village. That makes it easier to get around in the area. And if you rent a car, watch up for trucks. There are hundreds of them on Lapland roads, taking tons of Norwegian fish to the European market. But what did our students learn in their Lapland seminar? About the Sámi people, their health care and culture. The Arctic seminar was about the Sámi culture and how healthcare is arranged in rural and arctic areas, with extremely long distances to specialist healthcare. Here, you may have had to travel 400 km just to hear your elbow doesn’t need an operation. But that’s life in many parts of the world, not just in the far north. The Sámi people have their own culture and traditional clothing. You can see some samples on Sámi clothing in my pictures. The Sámi are the only indigenous people of Europe and one of Europe’s oldest cultures. They are 75 000 – 100 000 in number, living in the north: Norway, Sweden, Finland and Russia. Finland has 9 000 Sámi inhabitants speaking three different languages that all differ from the main language Finnish. The Sámi languages are North Sámi, Inari Sámi and Skolt Sámi. Kilpisjärvi is a Sámi region and as such the right place to learn about the Sámi people. One of the presentations was held out on the fell. Leena Valkeapää who has moved to Kilpisjärvi from South Finland told about her doctoral thesis on Sámi culture. Her book is a great work and very educative. The Sámi people have a nomad background. They are reindeer herders. Reindeer winter food is lichen and in summer they eat three kinds of green plants. So reindeer have to move between different zones in different times of the year, sometimes wandering long distances. Sámi herders used to move with them, living in simple tent-like huts called kota that they carried with them. Those days are gone. Today kotas are mainly used for recreation and reindeer herding is performed with snow scooters and helicopters. Yet Sámi people still keep their strong connection with nature. Even today the basic elements of the Lappish nature are strongly determining factors in Sámi people’s lifestyle: wind, reindeer, time, fire and the human being. 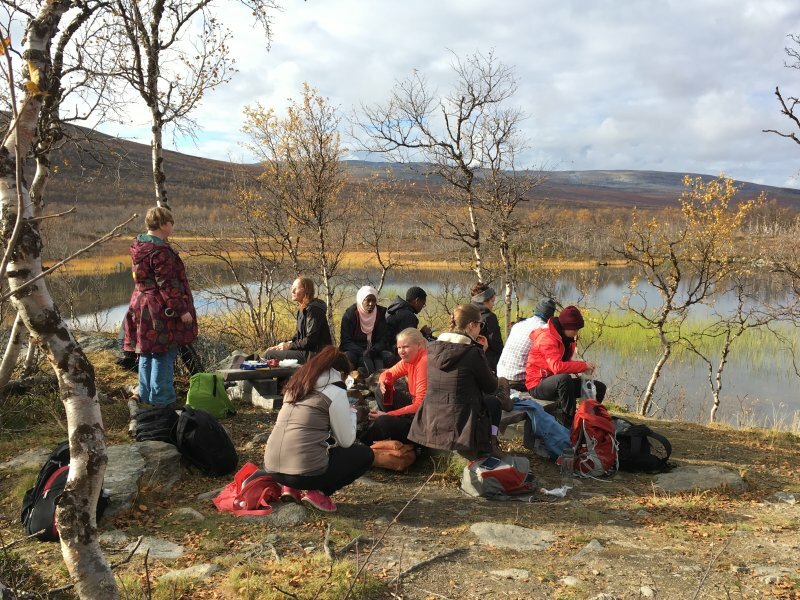 So the students, teachers and me went out into Lapland autumn to inspect those important elements. We started with reindeer. The Finnish Lapland is reindeer land. There are 200 000 reindeer wandering around in Lapland. Could we see any in Kilpisjärvi? Our international students so much wanted to meet those well-known animals. We heard that at this time of the year reindeer should be in the forest and that’s where we went. And we saw a lot of beautiful reindeer looking for food in the forest. Reindeer always move in herds so if you find one there will be more. But you don’t even have to go to the forest to see reindeer, you can find them right in the village as you can see below. After the reindeer we inspected the ruska. Lapland autumn leaves are fore many Finns the main reason for an autumn trip to Lapland. The Finns use the word ruska for autumn foliage which is very intense in the north. Not just Arctic trees but also ground plants turn yellow, orange and red. That makes Lapland autumn landscape look like a painting. 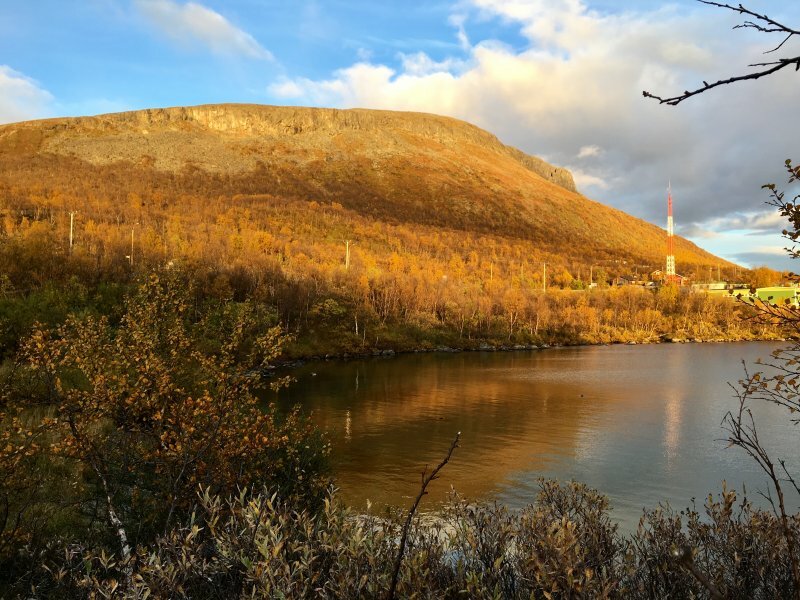 The Ruska travels from north to south and normally the peak season in Kilpisjärvi falls on the first or second September week. After that the ruska leaves Kilpisjärvi and goes to Levi and Ylläs, down to Rovaniemi and Kuusamo and further down. The next thing we inspected were the berries. In autumn Lapland’s forests are full of tasty Arctic berries waiting to be picked, by you. Lapland has wild Arctic berries all over the place. And what’s best you’re free to pick them, as much as you like. They are real super food and taste good. Blueberry, lingonberry, crowberry, cloudberry and other sorts that I don’t even know what they are. Now we had seen Lapland autumn colors and reindeer and picked Arctic berries. But we have not seen any auroras – yet. So we went out after ten at night and started looking up to the stars. The night sky was clear and starry which predicts good aurora weather. Northern lights can be seen around the magnetic poles in north and south. Northern Lapland is one of the best places to view auroras. In northern Lapland the auroras are visible almost every other night from September to March. This is the time of year when the sky is dark enough. The best chances are said to be around the autumn and spring equinoxes: September, October and March. Provided there are no clouds. In summer the sun never sets in Lapland and it’s never dark. You can’t see auroras in summer. The best time to see northern lights normally is between 10 pm and 2 am. You never know for how long the show will last, it can last for a few minutes or for hours. There are no ways to predict when exactly the lights will appear but there are aurora forecasts. You can easily download an app that will notify you when it is the best time to see northern lights. Different cultural groups in north and south from New Zealand Maoris to Indians, Inuits and Sámi people in the north have their own myths. The Sámi people’s folklore says the auroras are caused by a running fox. It whips up snow with its tail and sends sparks up in the sky. Science again says the lights are caused by electronic particles from the sun that enter the atmosphere. They collide with each other which makes them shine in colors, mostly in green. Whatever the reason is, these dancing lights are magic. You don’t know what I’m talking about until you see it yourself. If you ever take an autumn trip to Lapland hike in the fells. Use wooden walkways, climb to fells and walk around lakes. For long hikes (around 10 km) Kilpisjärvi has the Saana trail that you can find on my map, marked in red. It climbs to the top of Saana. Another option is to walk around Saana fell or to Tsahkaljärvi behind it. And then there is the Malla trail to Malla Strict Nature Reserve. The short hikes go to Tsahkaljärvi from the Visitor Centre or to Three Nations Border Point first crossing the lake by boat. These all are day hikes. For overnight hikes and for more information on short hikes see the interactive trail map Excursionmap.fi. We did two of the day hikes: the one to Saana fell and the one to the Three nations border point. I will show you those hikes. The hikes we took are marked with a pink line on the hiking map above. The Saana hike is 8 to 9 km if you use the same track both ways. We did that. The track starts at the caravan park where the Hiking Centre is and goes first up in Alpine birch woods. After the wooded area ends it’s all tundra with low growing vegetation – until there’s no vegetation at all, just stones in all sizes. The Saana climb is steep and that’s why there used to be stairs. This autumn the stairs were away. Never mind, there was a trampoline, just to relax after the first heavy climb. It’s very cold at the fell top, and windy. Be prepared and bring warm clothing. And bring something to eat and drink, there are no after ski bars on this fell. So that was the Saana hike. We all loved it and as it was very cold up there we very much appreciated the sauna evening afterwards. Starting from Kilpisjärvi village: take a 30 min boat trip and hike 3 km to the Three nations border point. That is where the Nordic countries Finland, Sweden and Norway meet. They have built a yellow marker in the exact meeting point which happens to be in a mountain lake, Lake Koltapahtajärvi. The marker needs a basement so they made a small artificial island and a wooden boardwalk around the marker. Here we are, most of us on the Finnish side just two steps from Norway which is on the right and also a few steps from Sweden on the left hand side. And here we are, most of us on the Norwegian side, exploring ice-cold Arctic waters. For what reason? One of us was so exited about the place that she dropped her phone in Norway waters. We tried and tried and finally got it back from the lake bottom. The phone didn’t seem to mind Arctic waters. It was still working but gave a message that for some reason there appeared a humidity problem. From Koltapahtajärvi there’s a short hike following Norwegian border signs to an open wilderness hut that any hiker is free to use, the Kuohkimajärvi hut. Above you can see the path. As you can see this 3 km hike (6 km two ways) from where the boat takes you to is quite easy to walk. If you don’t want to walk the same trail two ways you can return to Kilpisjärvi village through Malla Strict Nature Reserve which makes a longer hike, 16 km. The hut has a beautiful setting by a small lake and we sat outdoors and had a picnic lunch. If you need more drinking water you can just take it from the mountain river. The river water is fresh and ready to drink. Finland has the world’s cleanest climate. We returned from Kuohkimajärvi along the same path, round this lake. And took the Malla ship back to Kilpisjärvi village. The Malla ship leaves from Kilpisjärvi village three times a day during summer. It takes you to Koltaluokta behind the lake where the three km trail begins. You pay the driver directly, adult fare return is EUR 30 (2018). You can use the ship both ways and hike to the three nations border point and back (6 km in all). Or take the ship just one way and hike 16 km back through Malla Strict Nature Reserve. Reserve half a day for the shorter trip, a full day when returning through Malla. That was our last hike and it was time to take the long way back to Tampere. The university was waiting to see us again. All of us were impressed by what we had seen and learned in Lapland. The students take their greatest experiences to the nine different countries they come from and share them with friends and family all over the globe. What exactly are these students studying and why did they choose to study in Finland and not somewhere else? These international students are taking two-year studies in the University of Tampere Public and Global Health Master’s Program (PGH). Students gain an understanding of the core elements of public health including epidemiology, health promotion, health systems and health economics. On the other hand, global issues such as health effects of migration and poverty, gender-related health issues and health in disasters and humanitarian conflicts are studied. A majority of the students have a bachelor’s degree and some of them already have another master’s or a medical degree. Their backround is mainly in health sciences but also in medicine and other fields. In this group most students also have international work experience, often from many parts of the world. Many of the students applied for this program because of the specific profile of the program and because of the university’s reputation for good teaching quality. Feedback from current students often emphasize the easily approachable faculty and interactive teaching methods. There is a lot of potential in a group like this – therefore students are encouraged to interact, learn from each other and share their thoughts. In 2017 the PGH program was awarded the university’s annual “Ällästikku prize” for excellence in teaching or councelling, this time it was issued for integrating students into the university community. This prize was used to finance this trip: a shared once in a lifetime experience of students and staff. WOW. Amazing place and great photos. Thank you for sharing this experience.